Our question for #RPGaDay today is, ‘Which RPG offers the most useful resources?’ You are free to define resources as befits your experience and needs when running a game, of course. There are thousands of games, and many ways to run them. In your experience, what is a game that provided good support for you as a GM or player, and what form did that support take? The resource type that I would like to focus on for this question is the inclusion of a good example of play. These are not easy to write, and can use up a lot of space, but in my opinion are extremely valuable for introducing a new game to the reader. As a resource, they are of primary use in learning and teaching the game, and then are relegated to the junk drawer of memory, I suppose, but I feel that without a resource like this to draw upon, many excellent games would not get played by nearly as many people. While a resource such as the Hellfrost or Gloranthan Atlases will be used regularly throughout a campaign, the campaign’s very existence might be owed to a cogent and engaging example of play. The primary goals for an example of play are two-fold. The first goal is to present the use of the core system information in the context of what the designer feels is a typical scene for the game. The second goal is to convey the expected play style or atmosphere of the game. I find I suddenly have a lot to say about this topic! I had better nip that in the bud or I will be here typing all day. Two examples of play that I wish to mention as having been very useful resources for me to learn new games are the ones in Greymalkin Designs’ ‘Desolation’ RPG, and Samjoko Publishing’s ‘Worlds in Peril’. Greymalkin’s example of play for Desolation was very useful to me as it portrayed Ubiquity in action both as a system and as a culture of play. It imprinted on me quite strongly in a way that the one given in the original release of the Ubiquity rules in Hollow Earth Expedition did not. While the one in HEX was extremely useful for getting comfortable with Style Points, what gave the one in Desolation the edge for me was its clear delineation of the shifts between IC and OoC talk that might occur during a scene, its inclusion of multiple characters of differing types, and its coverage of the basic rules. 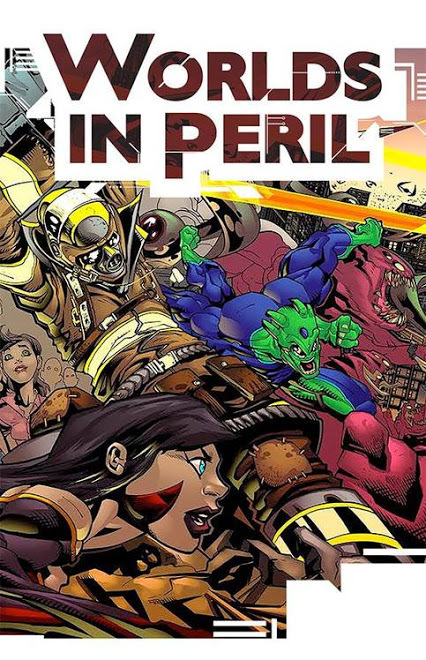 Worlds in Peril, an adaptation for super heroes of Vincent Baker’s system for Apocalypse World, is a great example of a different and less-common approach to the example of play: using a comic. Very fitting to the genre being emulated, and very effective in communicating system information, culture of play, and the sense of engagement and imagination resulting from play, this example of play brings the methodology and fun of gaming ‘powered by the apocalypse’ right out into the open, in 4-color excitement. Question 27: What are your essential tools for good gaming?